A group of frogs were hopping contentedly through the woods, going about their froggy business, when two of them fell into a deep pit. 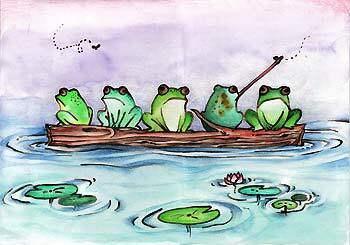 All the other frogs gathered around the pit to see what could be done to help their companions. When they saw how deep the pit was, the rest of the dismayed group agreed that it was hopeless and told the two frogs in the pit that they should prepare themselves for their fate, because they were as good as dead. Unwilling to accept this terrible fate, the two frogs began to jump with all of their might. Some of the frogs shouted into the pit that it was hopeless, and that the two frogs wouldn’t be in that situation if they had been more careful, more obedient to the froggy rules, and more responsible. The other frogs continued sorrowfully shouting that they should save their energy and give up, since they were already as good as dead. The two frogs continued jumping as hard as they could, and after several hours of desperate effort were quite weary. Finally, one of the frogs took heed to the calls of his fellows. Spent and disheartened, he quietly resolved himself to his fate, lay down at the bottom of the pit, and died as the others looked on in helpless grief. The other frog continued to jump with every ounce of energy he had, although his body wreaked with pain and he was completely exhausted. His companions began a new, yelling for him to accept his fate, stop the pain and just die. The weary frog jumped harder and harder and – wonder of wonders! Finally leapt so high that he sprang from the pit. Amazed, the other frogs celebrated his miraculous freedom and then gathering around him asked, “Why did you continue jumping when we told you it was impossible?” Reading their lips, the astonished frog explained to them that he was deaf, and that when he saw their gestures and shouting, he thought they were cheering him on. What he had perceived as encouragement inspired him to try harder and to succeed against all odds. This simple story contains a powerful lesson. Your encouraging and appreciating words can lift someone up and help him or her make it through the day. Your destructive words can cause deep wounds; they may be the weapons that destroy someone’s desire to continue trying – or even their life. You have the power–at all times, to choose your words and your act–never underestimate its influence on the other! Yes. words can either make or mar a life….but it takes maturity to choose proper words at all times….thank u….i need to work on this…. excellent story and even more inspiring are Maharaj’s comments on it . really very inspiring to all of us . Nice moral story.If we use words properly then we can able to make friends otherwise we are responsible to create our own enemies. We must fix our words, our actions and our mind on a higher principle to achieve a higher goal.-so true others the distractions of this world can completely destroy one. This article based on the higher principle of positively engaging the body, mind and words emphasised by HH Radhanath Swami is truly inspiring. we have the power–at all times, to choose our words and our act–never underestimate its influence on the other! A very nice and thought provoking article, having a deep lesson in it. Very beautiful story ,never heard of such deep meaning just for ” words ” Hare Krsna ! Although I hardly thought words to be of so much of importance in my daily communication language but they actually create such a grave impact in all of our lives… it is shown through this foggy story…Thank you for this thoughtful sharing …! This article truly depicts the power of sound vibrations. Its a caution not to use words loosely. It makes or mars another persons life. 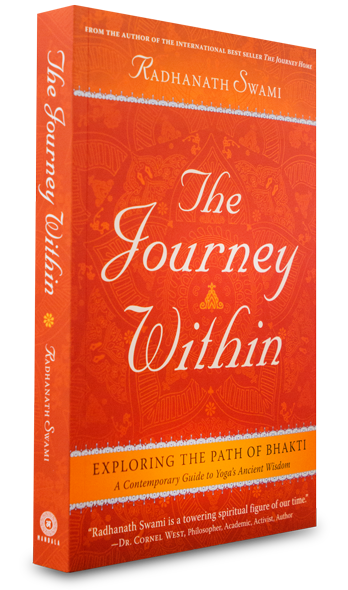 Another masterpiece from Radhanath Swami…. Quite true that what we speak can affect other’s actions. Very instructive. Thanks a lot for this wonderful story. Beautiful article highlighting the need & importance of encouragement in a person’s life. Words can do miracle at times. Radhanath Swami is too humble to realize how much his own words of encouragement and direction mean to those who hear him. There are so many stories of people whose lives have changed due to simple words he said. Yes, we must fix our minds on a higher principle.. and I’m sure Radhanath Swami has the highest and the ultimate goal in his mind… and that is what makes his own words so powerful. Thoughts & words are constant companions for every human being & just by excercising control over these, one can achieve all perfection. Isn’t it amazing! Thank you Radhanath Swami and the admin team for sharing this inspiring point with us. Thank you Maharaj for giving such a wonderful message of how encouraging and appreciating words can lift someone up and help him or her make it through the day. This is a wonderful lesson to be learnt to always appreciate and encourage others. Words are so important, is beautifully portrayed in this wonderful article by H.H. Radhanath Swami Maharaj. Really it’s very important to choose our thoughts, our words and our actions very appropriately to progress in spiritual life. This story brings to memory all the harsh words I have spat at others and all the heartbreaks I have caused. With a painful heart I repent for them. Radhanath Swami’s practical wisdom makes him a super relevant figure even in his robes of a renunciate monk. controlling the words and thoughts …. great wisdom…. Thank you Maharaj.. Very True, Thank You for making me realize that i have done so many mistake by using harsh words. With full devotion i will try to implement the encouraging and appreciating words for others in my life. Thank You. Nice story for explaining the concept of focusing on the higher principle. Every word is precious and we should keep trying to speak only the positives to give hope and encouragement to everyone. Thank you for sharing. Radhanath Swami Maharaj beautifully explains the power of speech which we all possess. This article emphasizes how we need to choose our words carefully. Wonderful story, teaching many vluable lessons to us. one of them can be – It depends upon us how we take others comments………. Yes. We need each others encouragement, love, care, support to overcome temptations and later achieve greatest heights in life. True- the association you have … surely decide your future..
Our speech is very important…In fact it is the most important senses which needs to be controlled.. If only we learn when to speak and what to speak 70% of our problems can be solved !